What is an Eosinophilic Granuloma Complex? Kitty does not like vets. She certainly was not going to open her mouth and say Ahhhhh. 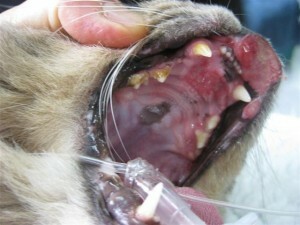 So Kitty came in for an anaesthetic and when we opened her mouth we found some interesting lesions. You can see the photos below.We took a sample of the tissue and sent it off to the laboratory and they diagnosed an eosinophilc granuloma complex. After we confirmed there was no other cause of disease and also confirmed that she did not have any of the nasty cat viruses (Feline Leukaemia and Feline Aids) we treated her with a glucocorticosteroid. The good news is she is better but the bad news is she will likely require life long medication. A granuloma is a solid grouping of inflammatory cells coming together in a lump or solid structure. 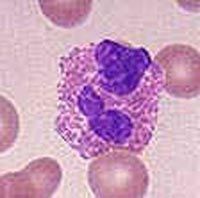 An eosinophil is a type of white blood cell that is commonly associated with allergic responses or with parasitism. Eosinophil counts will go up on a blood test when a pet has fleas or worms or when an allergy is flaring up. Eosinophils can circulate in the blood or they can infiltrate tissue. They are part of the body’s pathway to fight foreign materials and expel them from the body. Unfortunately, they can be tricked into thinking that some sort of benign materials (pollens, dust, etc) are attempting invasion. In this instance (allergy) they release their inflammatory chemicals inappropriately, creating the sensations of itching, swelling, redness and other symptoms of allergy. The eosinophil has a characteristic appearance under the microscope due to the presence of pink staining granules. The pink staining granules contain assorted toxins and biochemicals designed to attack an invading parasite. These granules can be thought of as small bombs directed against large invading organisms such as worms.